New York City's annual holiday markets deliver a quintessential holiday shopping experience in the Big Apple. The massive outdoor fairs unfold in scenic locales like Bryant Park, Union Square, and Columbus Circle. There's even a great indoor option at Grand Central Terminal, for those ​averse to cold fingers and toes. Shoppers can browse an eclectic mix of boutique-style vendors and refuel with seasonal food and drink. Unfolding behind the majestic New York Public Library building in Bryant Park, the Bank of America Winter Village offers a winter wonderland atmosphere complete with ample open-air shopping. Browse more than 125 boutique-style vendors, including over two dozen food stalls selling tasty treats from around the world. 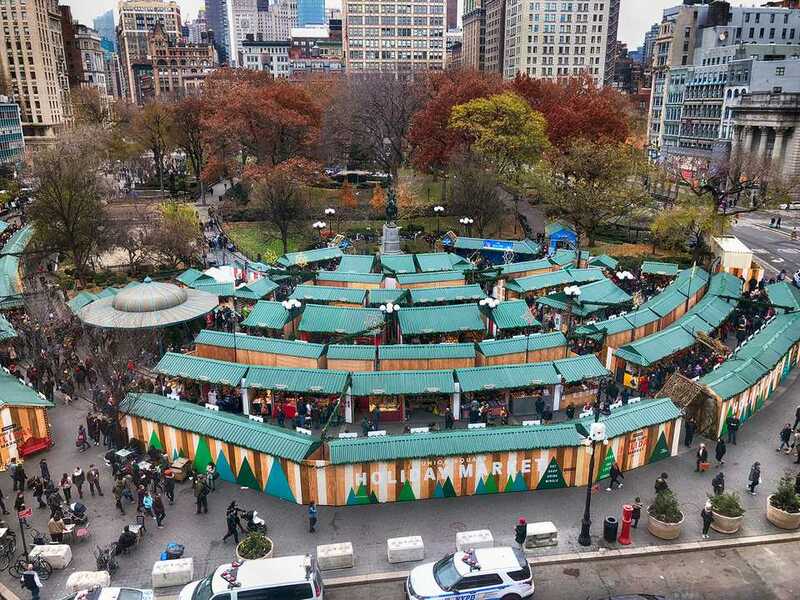 Look for many returning favorites from years past, selling jewelry, toys, clothing, imported chocolates, and stick around for some ice-skating, too—it's the only rink in Manhattan to offer free admission but skate rentals are extra $20.00. Where: Bryant Park, West 40th to West 42nd Streets, between 5th and 6th Avenues. When: Runs through January 2, 2019; hours are Mon–Fri, 11 a.m.–8 p.m., Weekends 10 a.m.–8 p.m.
Join the throngs of daily commuters and head over to Grand Central Terminal for an array of holiday gear. The majestic Vanderbilt Hall sets the stage for the annual indoor Grand Central Holiday Fair and is a perfect option for days when temperatures plunge. Founded in 1993, the fair is chock-full of art, clothing, jewelry, home goods, bath and body products, toys, and more. Stick around for the annual Holiday Train Show at the nearby New York Transit Museum Gallery Annex & Store, or check out New York-made food and beverage products for the locavore in your life at the Taste NY store (set across from track 37). Where: Grand Central Terminal's Vanderbilt Hall, 89 East 42nd Street at Park Avenue. When: November 12 through December 24, 2018; hours are Mon–Fri, 10 a.m.–8 p.m.; Sat, 10 a.m.–7 p.m.; Sun 11 a.m.–6 p.m. On Christmas Eve the fair runs 10 a.m.–6 p.m. and it's closed on Thanksgiving. At the southwest entrance of Central Park, across from the Time Warner Center (and its Shops at Columbus Circle mall, with its fantastic holiday display), the Columbus Circle Holiday Market is put together by the same team behind the Union Square Holiday Market. Now in its 15th year, shoppers will find around 100 booths featuring eclectic handmade wares and artisanal food from vendors hocking everything from hot cocoa to ethnic cuisine. Expect gift items like chocolates and truffles, jewelry from up-and-coming designers, clothing and accessories, home accessories, and more. Where: Columbus Circle, at 59th St. and Central Park West. When: November 28 through December 24, 2018; hours are Mon-Sat, 10 a.m.– 8 p.m.; Sun, 10 a.m.–7 p.m.
Uptown locations aren't the only option for holiday shopping. The Union Square Holiday Market is an atmospheric, alfresco haven that has welcomed hordes of shoppers for more than two decades. The market hosts more than 150 small business vendors (many of them from the NYC area) tucked behind cheery red-and-white-striped tents in Union Square. Look for artisanal food products, holiday ornaments, children's toys, original artwork, handmade jewelry, and more. Food and drink vendors are on hand, live music, a warming station and even a kids' section where holiday art projects are displayed in partnership with the Children’s Museum of the Arts. Where: Union Square Park, East 14th to East 17th Streets, between Broadway and Park Avenue South. When: November 15 through December 24, 2018; hours are Mon–Fri, 11 a.m.–8 p.m.; Sat, 10 a.m.–8 p.m.; Sun, 11 a.m.–7 p.m.